Join Bush Warriors: Walking on Wildlife on facebook here. One way of raising awareness about the world’s so many wildlife crises is by putting the real, hard information right in front of everyone’s faces. In this way, we are all forced to see the truth and we have no choice but to react. Our latest initiative will do just that, and on a global scale. We are giving challenging you, fellow Bush Warriors, join our army and take action with our new campaign: ‘Walking on Wildlife’. We are asking all of you wildlife lovers out there to take our message to the streets and tell it like it is. The idea is simple. We will provide updated statistics on our website for a variety of issues that are pushing our planet’s wildlife to the brink of extinction. 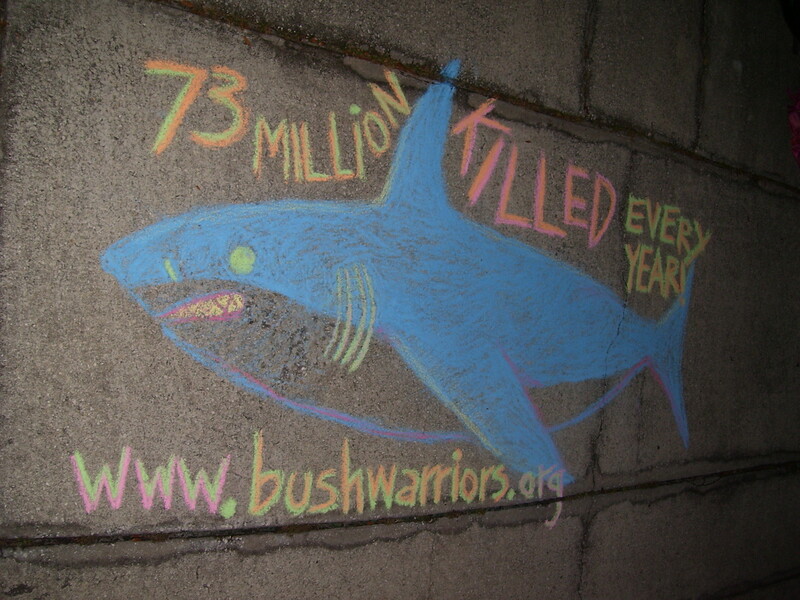 Bush Warriors all over the world will take those statistics and write them on the ground in the busiest parts of your city or town with sidewalk chalk. The message is loud and the task is easy. It takes little time and has enormous effect. Imagine how many people will walk by or over it and will be forced to see the number of rhinos, sharks, or tigers killed. It’s one boisterous way to act as a voice for wildlife! Identify one of the busiest parts of your city or town. Take sidewalk chalk to that location. Draw the animal you wish to write the message about and the powerful words that you will find on our ‘Walking on Wildlife’ page. We encourage you to use the exact phrases and numbers we’ve provided you with here (see above messages), in order to display the most accurate information and to be the most effective. BE SURE to write ‘bushwarriors.org’ somewhere on your message so that people can come to our website and be educated on these issues. BE PROUD! You’ve just reached someone in your town or city with information about this animal that he or she was previously unaware of. You’re a loud voice for wildlife and you are making a difference! Watch awareness take hold and spread like wildfire, as people around the world do what you’ve done in their own cities and towns! It doesn’t matter who you are or if you live in a small town or a big city. Age, gender, religion, race, profession, or anything else… none of it matters! ANYONE can do this ANYWHERE! The effect is the same. Not enough people know about these issues and it is our jobs, as ambassadors to wildlife, to tell the world and encourage action! Watch our founder, Dori, doing ‘Walking on Wildlife’ in New York City! You can see how important this campaign is, by the video above. We made it in late October, when the poached rhino toll in South Africa was at roughly 235. Only two months later, at least 75 rhinos were killed! During that period of time, some 12 MILLION sharks were killed, as many as 6,000 elephants, tens of tigers, probably thousands of pangolins, and frightening numbers of so many other species. All at the hands of man! 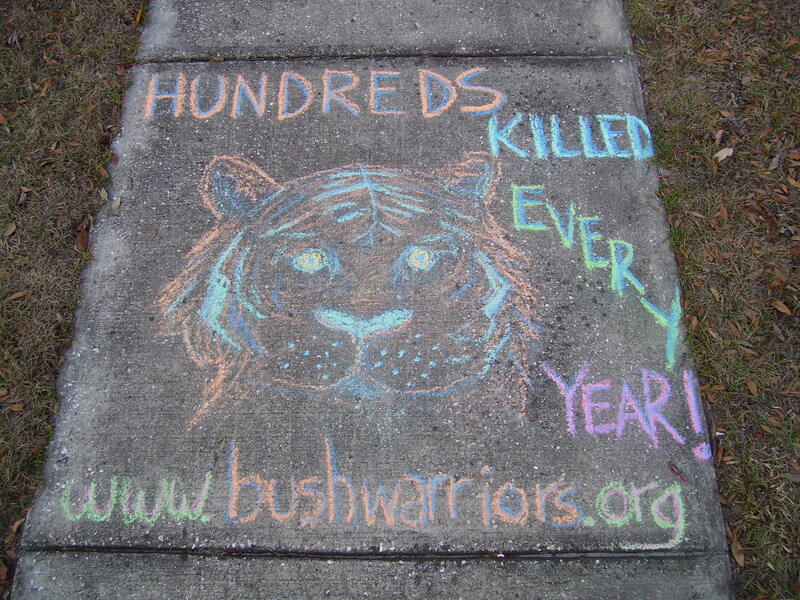 Each day we will share one of the submitted photos (with your name and location of your message) on our blog for everyone to see the beautiful work Bush Warriors are doing all over the world. As the momentum builds, more will take interest in our message. Perhaps your local news will take interest and ask what this is all about. That’s an excellent gateway to getting wildlife issues into the foreground of mainstream media, which is a HUGE step for calling attention to and halting the numerous wildlife crises growing out of control today. There are also prizes involved! You will have the opportunity to win a Bush Warriors T-Shirt if you win one of our Walking on Wildlife contests! The first competition? Biggest Walking on Wildlife display! Whoever draws the largest message (in size) each month will win a t-shirt! If you’re shooting for the largest, be sure to include the size or measurement of your display when you submit your photo. If you have a Bush Warriors shirt, wear it while you make your Walking on Wildlife display! Have a friend or family member take photos of you doing it IN your shirt! Click here or click on the image to buy a shirt! We can’t wait to see what you guys come up with and we want to see it all over the world! 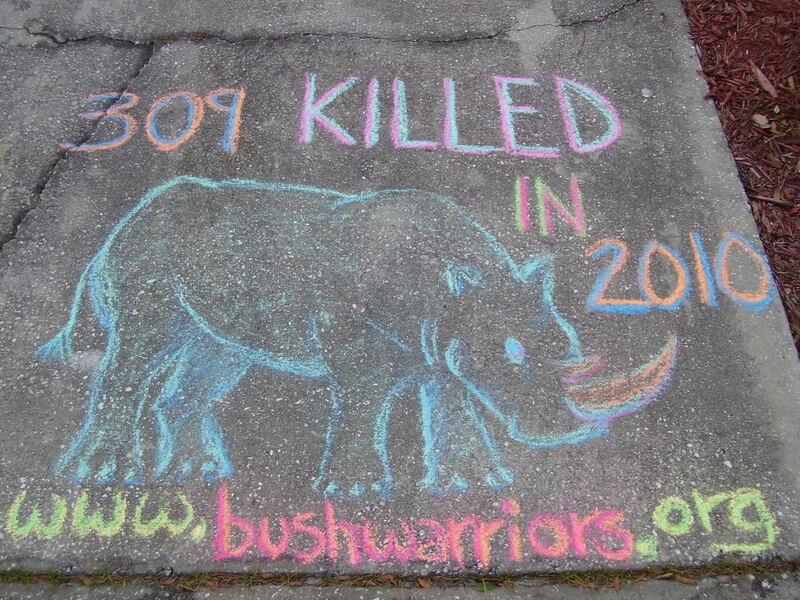 Come on Bush Warriors, be a voice for wildlife! Get loud and be proud! We CAN make a difference! At last we will all be able to do something constructive for the planet’s wildlife. I am going to ask every artist/budding artist and teachers I know to help. When can we start please? I will now be permanately be carrying sidewalk chalk with me and a printed version of this page to send out the message everywhere. You have just earned another bushwarrior. I think this is a GREAT idea, a wonderful way to get such an important message out to thousands of people! One suggestion though….add more reptile and amphibian stats for folks to share. Reptiles and amphibians face just as many, if not more, challenges as everything else. There are species of frogs being declared EXTINCT every day! People don’t see how one little frog or salamander can make a difference in the realm of things. Lets get out there and make a difference! i have put these shark posters up around my town already 🙂 this is a great idea! madison, that’s great! please send us some photos at bushwarriors@gmail.com can’t wait to see!! plz also post the photos to the bush warriors: walking on wildlife facebook page! THANKS! keep up the good work!!! Great idea. But why advertise your t-shirts when you click on the buy button there are no producys available? Great Idea!!!!. I will definitely display the same in our small city, SAGAR, Shimoga INDIA. And let you know the same. Hi, i was wondering if anyone is in Durban South Africa or anywhere else that they do sand sculptures then maybe the facts above could be used in the sculptures to raise awareness. I am not in South Africa otherwise i would ask personally, maybe for some small remuneration someone could ask the guys who do these great creations to help the fight against all this genocide of Earth’s fellow creatures.